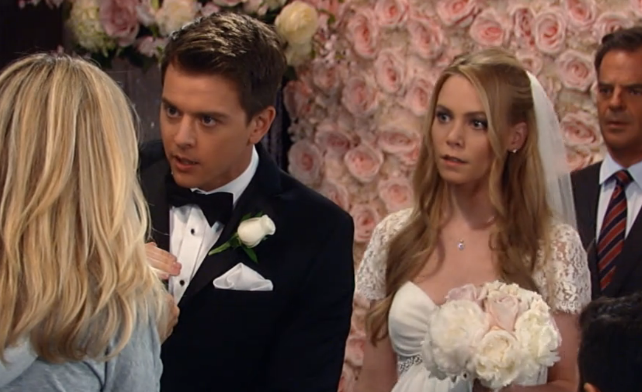 Nelle (Chloe Lanier) and Michael (Chad Duell) were standing at the altar at The Metro Court as Ned (Wally Kurth) was performing the wedding ceremony. Suddenly, Carly burst in and announced that her son would not be getting married today. Jason (Steve Burton) and Sonny (Maurice Benard) couldn’t believe Carly hadn’t listened to them and broke out of Ferncliff. Since Ava (Maura West) had called the police to report Carly’s escape, Chase (Josh Swickward) was forced to take her in. Before she left with the police detective, Carly looked at Ava and told the wedding guests that Nelle had help to pull of the stunts. Bobbie (Jackie Zeman) warned Ava that everything she’d done would come back to haunt her and Ms. Jones wanted a front row seat to watch when it happened. Nelle wanted to continue with the ceremony but soon doubled over in pain. At the PCPD, Jordan (Vinessa Antoine) told Jason and Sonny that as Carly had overpowered the head nurse and injected her with a sedative in order to escape, Mrs. Corinthos’ fate was now in the hands of the court. At General Hospital after Lucas (Ryan Carnes) told Michael that Nelle and the baby would be okay, Nelle told Michael she still wanted to get married that night. Griffin (Matt Cohen) wondered if there was any truth in what Carly said about Nelle having help and whether Ava had been involved. Michael called Ned and asked him to come to the hospital to finish the ceremony. Then, Michael called Jason as his best man and asked him to come to General Hospital because he and Nelle were still getting married.. Sonny reminded Carly their goal was to get her out of Ferncliff but her antics made that so much harder. Ned finished the ceremony and Nelle and Michael were pronounced husband and wife. As Carly was taken back to Ferncliff pending judicial review, she urged Sonny to watch out for Michael. Jason gave Ned a pen so he could sign the marriage license. Does this pen have disappearing ink so that Nelle and Michael won’t be legally married? Josslyn told Michael she had something to tell him about Nelle and Detective Chase. At Ferncliff, Rupert reminded Carly that he was just an orderly and after what she pulled, she’d now be at the mercy of Mary Pat (Patricia Behune). Sam (Kelly Monaco) told Drew (Billy Miller) that she didn’t regret the time they spent together. Nelle overheard Michael tell Josslyn he wasn’t worried about the kiss she (Nelle) shared with Chase. 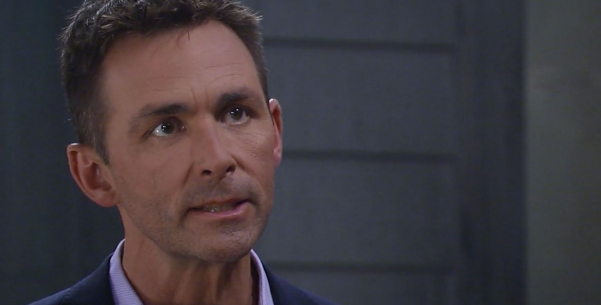 At General Hospital, Finn (Michael Easton) wasn’t pleased when he read a chart and found Valentin (James Patrick Stuart) in a waiting room. Valentin told Dr. Finn that he wanted him to test him for the West Nile virus. Valentin added that he may have been exposed to the virus on Spoon Island but if that were true, the CDC would have notified him said Finn. Curtis (Donnell Turner) encouraged Drew (Billy Miller) to get back into the dating scene in order to get over Sam (Kelly Monaco). At the PCPD, D.A. Margaux Dawson (Elizabeth Hendrickson) berated Jordan (Vinessa Antoine) for not telling her about Carly’s escape from Ferncliff. Jason (Steve Burton) arrived at General Hospital to pick up Jake to take him to a baseball game. But Jake had invited Franco (Roger Hogwarth) to join them. Franco convinced Jake to spend the special alone time with his dad. At The Metro Court, Nina (Michelle Stafford) attempted to have the ads Valentin had purchased placed at the back of the August issue of Crimson. Maxie (Kristen Storms) noticed how out of control and unhinged Nina was. She was also curious about the large take out order Nina had. Meanwhile, Peter (Wes Ramsey) urged Liesl (Kathleen Gati) to come clean and admit her guilt for being the reason Nathan was killed because she never told anyone that Faison was his father. Upset by Peter’s words, Liesl left the stables. Finn came to the PCPD and told Sam and Jordan about Obrecht possibly being responsible for Peter going missing. He shared with them the story Wyatt told him about the man in the cabin and then gave them the notebook. At that moment, Franco also told Elizabeth about the theory Liesl had kidnapped Peter. Liz encouraged Franco to do the right thing and tell the police what he knew. But when he arrived at the PCPD and heard Sam, Curtis and Jordan discussing Liesl kidnapping Peter, he changes his mind. The Woodchucks baseball game was canceled but Jake and Jason still spent father son time together. Drew met Margaux when she accidentally squirted mustard on the back of his shirt. When Nina arrived at the stables, Peter again attempted to talk her into letting him go. Nina told Peter that she may have figured out a way out for both of them. Franco saw the Spoon Island quarantine notice on the docks and then ran into Liesl. Valentin recognized the new Metro Court bartender. Sonny (Maurice Benard) and Jason (Steve Burton) talked about Carly’s (Laura Wright) appeal. Chase (Josh Swikard) asked Michael (Chad Duell) whether he’s ready for stage two of the plan. Kim (Tamara Braun) examined Nelle (Chloe Lanier). She then told Nelle and Michael that Nelle’s pain was an extreme case of indigestion brought on during the last stages of pregnancy and congratulated them on their hospital wedding. Valentin (James Patrick Stuart) recognized the bartender at The Metro Court. Once he learned Kip was an actor, Valentin remembered their encounter on the docks and the West Nile virus quarantine then demanded to know who hired Kip. After Kip described the woman who hired, Valentin showed him a picture of Nina. Later, Sam (Kelly Monaco) and Curtis told Valentin their suspicions that Liesl has Peter. Valentin remembered Nina telling him about him (Valentin) forcing her to take the law into her own hands. But he lied to Sam and Curtis that Nina had taken his jet to go out of town on Crimson business. Nina (Michelle Stafford) suggested Peter (Wes Ramsey) turn himself in to escape Liesl’s (Kathleen Gati) fate for him. Nina said she’d drop him off by the freight elevator at The Metro Court then tip off the police. In exchange for letting him go, Nina wanted Peter’s promise he wouldn’t implicate she and her Aunt Liesl in his kidnapping. Julian (William deVry) showed Sonny the photo of Mike with Charlie Delaney. Later, Jason told Sonny he’d take Julian out if Sonny ordered it. On the docks, Franco (Roger Hogwarth) told Liesl he knew she had kidnapped Peter August but reminded her that revenge wasn’t worth destroying her life. He urged his friend to leave Port Charles for good and after she was safely gone, Franco would call the police and tell them where to find Peter. Instead, Liesl hit Franco with a bottle knocking him unconscious. Kim told Julian that she wouldn’t turn a blind eye if he turned to organized crime. Michael filled Sonny in on the plan, but his father worried something would go wrong. Later, Sonny warned Detective Chase he’d hold him personal responsible if Michael got hurt. As part of the plan, Jason and Michael talked loudly outside Nelle’s hospital room so she’d overhear them say after the baby was born he’d enforce the pre-nup and sue soul custody of his child. On the docks, Valentin heard Franco groaning. As Nina untied Peter, Liesl arrived at the stables and told Henrik it was the end of the line for him. Mike (Max Gail) saw the picture of his younger self with a young Charlie Delaney and the memory loss due to the Alzheimer’s caused him not to recognize Sonny (Maurice Benard) and frantically begged him to find his son and warned Sonny to stay away from Charlie Delaney. Valentin (James Patrick Stuart) heard Franco (Roger Hogwarth) groaning on the docks. But Franco passed out before he could tell Valentin what happened. And in a classic case of being at the wrong place at the wrong time, Valentin was arrested by Chase (Josh Swickward) for assaulting Franco. Sam (Kelly Monaco) and Curtis (Donnell Turner) told Maxie (Kristen Storms) their theory that Liesl (Kathleen Gati) kidnapped Peter (Wes Ramsey) and they had to find Nina (Michelle Stafford) because she may know something. Meanwhile, Liesl told Nina and Peter that Henrik’s time had run out. She was determined to kill Anna’s son to avenge the death of her son. Carly (Laura Wright) found herself in a padded cell at Ferncliff. Mary Pat (Patricia Behune) told her that as Dr. Collins (Jon Lindstrom) was off visiting his wife, Caroline’s new psychiatrist Dr. Lazarus had prescribed a sedative. Carly warned Mary Pat and Rupert that her husband Sonny Corinthos would make sure their lives burned down around them for hurting her. Mary Pat didn’t heed the warning and injected Carly with the sedative. At the PCPD, Valentin insisted on his innocence. At General Hospital, Franco regained consciousness and told Sam, Curtis and Elizabeth that Liesl was the one who attacked him. Liesl told Nina that she spent her life not being good enough and doing things for herself, but now she was going to do something for Liesl by killing Henrik. Sonny went to Ferncliff and asked Rupert where Carly was, but Rupert told him he couldn’t help. After learning from a nurse that there hadn’t been a case of West Nile virus in Port Charles in over ten years, Maxie went to the docks determined to take the launch to Spoon Island. Nina was unable to stop her Aunt Liesl from throwing a molotov cocktail causing the stables to catch fire. Nina (Michelle Stafford) screamed as Liesl (Kathleen Gati) threw a molotov cocktail causing the stables to catch fire. Sonny (Maurice Benard) told Jason (Steve Burton) that Diane (Carolyn Hennesy) was able to obtain a court order to visit Carly (Laura Wright). Despite Mary Pat’s (Patricia Behune) objections, Diane was let in to see Carly and was shocked to find her in a padded cell and heavily sedated. An out of it Carly kept repeating how she had to stop Michael (Chad Duell) from marrying Nelle (Chloe Lanier). Meanwhile, Nelle and Michael returned home from the hospital. While Michael was upstairs, Nelle questioned Drew (Billy Miller) about having Jason’s memories and how to get away with murder. At the PCPD, Curtis (Donnell Turner) told Finn (Michael Easton) and Jordan (Vinessa Antoine) about Liesl knocking Franco out. Jordan puts an APB out on Obrecht, and Chase (Josh Swickward) released Valentin (James Patrick Stuart). On the docks, Maxie (Kristen Storms) told Lulu (Emme Rylan) the whole Nina/Liesl/Peter kidnapping saga. Valentin arrived and offered the women a ride on the launch. Sonny told Jason about the painful decision on having to put Mike in a long term care facility. Jason reminded that as Sonny would be the one to remember, he’d have to be comfortable with his choice. Later, Diane arrived and told Jason and Sonny how Carly was being treated after her escape and also her new strategy for giving Carly placed in Shady Brook or a monitoring of her medication to make sure she wasn’t over medicated. Liesl called out for Nina at the stable door and realized that her niece was right about her taking things too far. Peter’s words that due to her withholding the truth, she was to blame for Nathan’s death. Curtis stopped Liesl from escaping. After she was arrested, Obrecht told Jordan to give Anna the message from her (Liesl) that now they were even. Nelle called Chase and told him he was right about Michael. Then, she asked for his help. Valentin managed to pull Nina out of the stable fire. But she told him, Finn, Lulu and Maxie that Peter was still inside. The Week in Review recap I wrote for The Nerdy Girl Express.